We all are fascinated by the multi-colored ribbons announcing the social information. 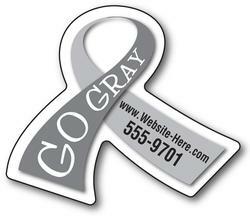 An awareness ribbon shaped full color magnet will never miss the customer attention due to its uniqueness. This magnet can be utilized to convey a great deal of social information. It can be easily customized against the payment of $0.09. This magnet is offered as indoor and outdoor magnet on special request. Advertisers can avail benefits of huge discounts on bulk purchases.